Johnstown native Dan Ruth wrote and is performing his one-man play, “A Life Behind Bars,” in Pittsburgh. After he graduated from Bishop McCort High School decades ago, Dan Ruth moved from Johnstown to New York City with big dreams. That experience is reflected in the tagline for his one-man play, “A Life Behind Bars,” which describes what happens “when you reach for the stars and grab the bottle instead,” according to its promotional materials. 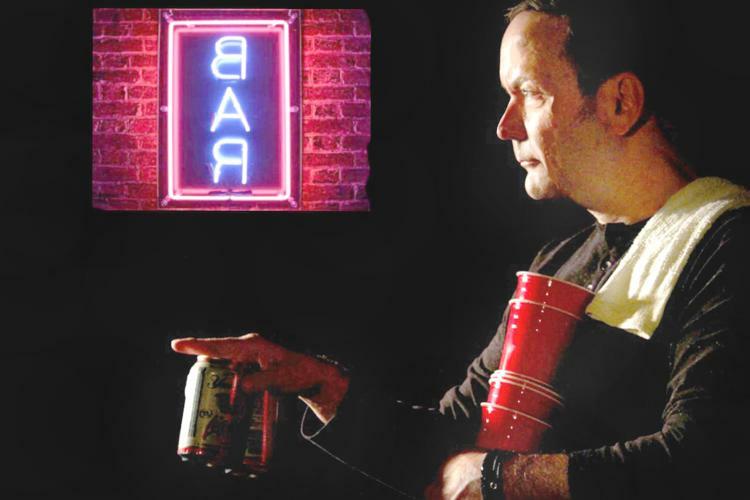 The black comedy draws on Ruth’s experiences working and drinking in the dive bars of New York City in the 1980s and 1990s; it focuses on the “roller coaster” nature of a big-city bartender’s job, he said. Ruth portrays 18 different characters – including an overzealous health inspector, an Andrew Lloyd Webber-loving piano bar regular and a “Brooklyn man-bun guy” who lives in an expensive high-rise building and “loves to snap at the bartender when he orders drinks” – during the play. “A Life Behind Bars” won the 2018 Producer’s Encore Award at the Hollywood Fringe Festival in Los Angeles, the 2018 New York City MAC Award for Spoken Word and the 2018 New York City Bistro Award for Outstanding Solo Play. Ruth performed it on Thursday and Friday and will perform it again at 8 p.m. Saturday at Carnegie Stage in the Pittsburgh area. Being the only actor on the stage, the sole focus of the audience’s attention, for the duration of the one-man play comes with some unique challenges, according to Ruth. The minimalism of the play’s production presents another challenge. Ruth was a full-time bartender and bar manager for years, letting his dreams of an acting career lapse. Recently, however, he got back to his roots, dipping his toes back into the water of the business for which he’d first moved to New York City. He “hadn’t written a show since 1997,” he said, when he began developing “A Life Behind Bars” in 2014 as part of a theater workshop. He first performed it in 2015 to a sold-out crowd in New York City. “I … took back my life after 15 years in the bartending industry,” he said. While he’s still tending bar in Times Square “as a way to afford the luxury of being an artist in New York City,” he’s also booking the play, which is directed by Tanya Moberly, in venues and festivals throughout the United States and internationally, writing a new solo play and directing performances by other actors.